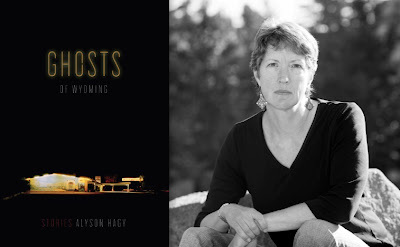 In the seventh in a series of posts on 2010 short story collections entered for The Story Prize, Alyson Hagy, author of Ghosts of Wyoming (Graywolf Press), answers a few questions about her work. “Brief Lives of the Trainmen” is probably one of the wildest stories I’ve ever tried to assemble. It’s one of those pieces that came to me—or at me—when I wasn’t looking, kind of like a wicked fast ball. I was deep in the stacks of the University of Wyoming library searching for an old medical dictionary. I found it. But I saw there were some books on railroads nearby, so I pulled them, too. They were odd, regional volumes, the sort of thing that would make a transportation historian’s heart thump. But I was drawn to them for some reason. I carried them home. It turns out a couple of the books were about small-gauge railroads in Idaho, the lines that were built to support the gold and silver mines there. And some of the source material came from interviews with first generation rail workers. The stories these men told were awkwardly recorded. Most of them were mere fragments. But I started to wonder about how those men (and women) lived together as they were building rail lines. Then I dug up a single photograph of a work train. That was enough to seal the deal. Who wouldn’t want to write about a group of wildly different people crowded onto a train modified to include spaces like bunk cars, shower cars, tool cars, dining cars, museum cars? The coup de grace came when one of my English department colleagues made a crack about Plutarch’s Short Lives of the Noble Greeks at a department meeting. I’d never read Plutarch. I headed back to the library. I only took me a few seconds to realize that Plutarch’s use of the short biographical profile was just the structural kick in the pants I needed. I guess I was on a quest to document the lives of ignoble Americans as they scratched their way across the West. I just hadn’t known it. All of the anecdotes in the story—the way some men changed their identities once a month so the law couldn’t catch up to them, the wastrel behavior of Civil War veterans, the bigoted treatment of the Chinese—come from those flimsy little books published in Idaho. I also had a rollicking time trying to track down enough slang from the late 19th century to make the story sound authentic. I think of “Brief Lives of the Trainmen” as my homage to the dynamic, yet fragile, communities assembled by human beings as they do physical work together. Honest answer: A Good Man is Hard to Find by Flannery O’Connor. I’ve always been a reader, but being a writer never occurred to me until I read O’Connor and Welty and Katherine Anne Porter in college. O’Connor knew how to make literature out of the contradictions, passions, and hypocrisies of the rural South. Better yet, she knew how to record the way rural folk talk. My first reading of O’Connor came into me via my ears and my belly more than through my eyes. I’m the academic equivalent of a yard sale junkie. I wander around the edges of people’s lives and activities just as I wander through the stacks of the library, always looking, never quite sure what I’ll find. I pick up cast-off objects and tales. I eavesdrop, eavesdrop, eavesdrop. And I tend to ask people who know how to do things—like shoe horses, or fly ultralight aircraft, or design weather balloons—questions until they want to strangle me. I am an advocate of the impromptu interview, coffee or beer optional. Describe a technique you’ve learned from other narrative or non-narrative forms of expression. I’m lucky enough to sometimes teach a class in book art with a printmaker. I’ve learned to “see” layers and layering differently as I’ve watched Mark and the students work on monotypes or intaglio or whatever. They use line and color in the way I wish I could use words. I have also learned to appreciate the narrative tensions that you can create with collage. I think of the story “Oil & Gas” as a kind of verbal collage, a riff on the many mixed voices that speak in the American West these days.